I know, it's July I'm talking about Christmas. What in the world? There is a reason Christmas in July has become a thing and it's not just some marketing ploy. It's all about being prepared. When you start preparing in July, December really is the best time of the year instead of a time full of stress and craziness. START HERE! 7 things you can cross off your list now so the only thing you'll be doing this December is celebrating. There is a reason this post has been so popular. Help your family stay focused on the most important thing this Christmas, Christ with these ideas. Even better, use some of these studies and add your notes to them so you'll have a clear vision of what you want to do this year. Who doesn't love to decorate Gingerbread Houses? Make it a party and you'll have decorations galore. Plus NOW is the time to stock up on graham crackers for easy to make houses. Pick the day you want your party now because once October hits, the calendar starts to fill up fast! You'd really like to repay your neighbors this Christmas... the easy way. Doesn't it seem like everyone else has just got Christmas figured out?! You get the most adorable gifts and think to yourself, "Who has time for this?!" Well, guess what - YOU do! Especially when you start now using these great printables. Print these out now and start assembling. When Christmas comes all you have to do is hand them out. If money is always tight, it's hard to imagine scraping together even more for gifts. Do yourself a favor and start using some of these ideas to save for gifts this year. Trust me, I've been doing it this way for years. Love Christmas cookies? Okay. Silly question. You can start making some cookie dough now and stick it in your freezer. Better yet, you can start planning a Cookie Exchange so you don't have to make loads of different recipes. 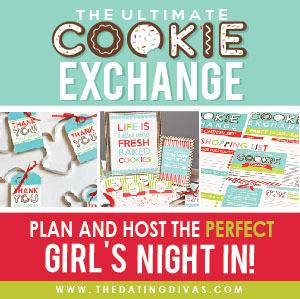 The Dating Divas have put together a darling cookie exchange and hot cocoa party! And the best part? All you have to do is push "print"! Get your friends thinking about it now and pick a date even in early November where you all bring cookie dough instead. You can stick the dough in your freezers and make fresh cookies all December. How many Christmas traditions are events rather than decorations? Start plugging them into your calendar now- your November self will thank you. Then ask your family if there is anything new they want to start this year like this booklovers tradition. Start asking your family and friends about their favorite Christmas books and why. You may discover some new favorites and be able to get them now at a great price. Share your favorites with us in the comments below so we can all find a new favorite. Do you give new pajamas at Christmas time? Add this free printable to your tradition for an extra meaningful moment. Start checking around Pinterest for other ways to make your old traditions easier and even a little better. Christmas is always a great time of year to focus on service. Plan what acts of service you want to contribute as family and individual this year. Don't know where to start? Volunteer your time on of these ideas. Who knows, you may find something that you can start doing now. And it's always a good time for spreading cheer over the phone! Whether you want to give the gift of time or experiences, put it in the works now. It's a great time to talk about favorites places and things to do because no one will suspect you of planning their Christmas presents. Not sure where to go? Try one of these 5 magical places in Southern California. They are a lot more affordable than you think and you can even put a lot of these ideas on lay away now and have them paid off in full for Christmas. All you will have to do is wrap them! Read this Christmas post now while you have the leisure of thinking about Christmas Eve and morning without all the hustle and bustle. As you go through the process of preparing for Christmas, start doing a few of things now. Then print out this free Christmas Eve checklist and add any extra things that you always need help remembering. Tuck it away in your Christmas gift hiding place to help you out in a few months. Print these beautiful quotes from the Living Christ out now to use for your Christmas decor this year. I don't know about you but I'm always pinning beautiful quotes and never get around to printing them all. I plan to fix that this year! One of my favorite parts of Christmas has always been the stocking stuffers. They are such an easy way to add so much fun. Are you growing tired of the typical orange/chap stick/socks route? Switch things up a bit this year with these ideas and printables from The Dating Divas- such good ideas! Then gather all your supplies, print off the tags, assemble and you're done! Put together your Christmas music playlists now! Download your favorite songs and make playlists for your Gingerbread House Party, for your Sunday afternoons, for Christmas Eve, for opening presents Christmas morning. It's easy when you have access to the music included with your Amazon Prime subscription. Amazon even has several playlists and Christmas stations preassembled for you. All you have to do is customize them to your taste. And while you're at it, give your daily life a soundtrack. Your Turn- What's one thing you are going to start now so Christmas is more fun than stress later?